Q: Can we calculate, from the results of the production schedule, the model of products to purchase, the delivery data, the quantity and the date an order is issued? A: When a production schedule is created based on the manufacturing orders in the Advanced Planning and Scheduling System it calculates the necessary timing and the necessary quantity of materials from that data. 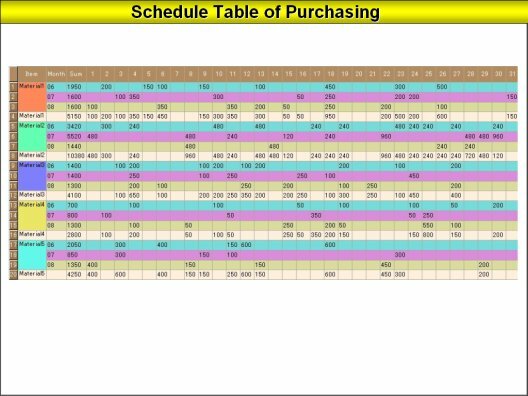 When purchase lead-time is assigned, the timing for the issuing of orders for materials is calculated and a purchase schedule table is prepared (see diagram below). What is important at this time, because the timing for the issuing of material orders is calculated from the results of theory of constraints scheduling, a more accurate timing of issuing orders can be obtained than it would be with MRP. In MRP fixed lead-time calculations, there is generally more than sufficient time for the timing of needed materials and it issues instructions for delivery sooner than when they are needed. That results in the creation of a mountain of raw materials in inventory. The scheduling purchases that are linked to production planning scheduling optimize timing and achieve a reduction in purchased product inventory.